As I filtered the ice cold milk this morning, and took my normal sip of the sweet liquid to ensure the collection meets the fresh taste test, I thought about the blessings of having the dairy does on the farm. I am very appreciative of the single doe that I have in milk right now, Iris, an alpine dairy goat. Iris has been in milk for nearly a year. Her volume has decreased dramatically, but she lets down enough milk to allow a fresh supply for my goat milk lotion. What I do not use for lotion, I freeze for soap. For those of you considering a dairy doe, you can keep your doe in milk indefinitely as long as she continues to produce milk. My trick is to supplement the dairy does with a good concentrate (grain). Watch the doe to ensure she does not thin out. You can increase the amount of concentrate to allow for the volume of milk, however, too much protein can thin a goat down. Make sure the doe is allowed to graze (or browse), and in the winter, or during lean grazing months, a good alfalfa mix hay is necessary. If you need to chemically worm a goat in milk, continue to milk her, but discard the milk for the recommended amount of time. If a dairy doe becomes sick, requiring antibiotics, I remove her from the milkstand for the season. I have only had to do that once. It seems the does in milk are generally full of health. I will keep Iris in milk until her final 2 months of pregnancy. She has not thinned out, she is still eager to milk, and Annie’s Goat Hill always needs fresh milk on hand! I hope you enjoyed this article. Let me know if you have any questions. Did you know goats before you “knew” goats? Meaning… did you have a knowledge base before you got into the goat business, or did you just plunge in and learn as you lived with the goats? I read just enough to know a little, then I plunged in. I then read and learned as if I had an addiction. There is a lot of good information available, and a lot of bad and conflicting information as well. If a person studies, takes materials such as books, magazinez and internet articles, combines what they have learned, sifts out what does not fit for their farm and circumstances, it can be a remarkable experience. It is interesting, still is to me. I have not been able to leave comments at your blog recently. I need to get on my PC and try again! on December 2, 2009 at 5:12 am | Reply KathyB. Mary, I read a lot about goats before I had dairy goats, but as is always the case..reality and experience are the best teachers! I also hope this is not TMI, but having breast-fed all 3 of my children and the knowledge of the successful nursing of my children until all were at least 1 year old and the many trials and tribulations of this wonderful experience also helped me know more about dairy goats than I can adequately explain. I think we fail to appreciate what ALL previous generations knew about livestock and just plain common sense biology and practice. If you add in our modern knowledge of health practice it seems we should have the ability to raise small home flocks and herd ( or maybe just one dairy animal)of animals to sustain us in hard times and in good..and do it economically.We would be healthier and happier too. Iris is a goat of immense value! Good thing she has you and she must know you appreciate her. Great post full of practical info! Knowledge from a book, magazine, or even wisdom passed along from a friend, cannot replace the experience. Experience, as anything in life, comes with trial and error, and solid knowledge. Kathy, I agree with you so very much, how much healthier and happier people would be if they could sustain themselves (even to a small degree) with animals. It opens up the world, very clearly. I haven’t milked in a long time! 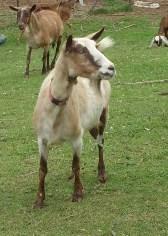 Amy – I am thoroughly enjoying milking one goat…just one! I cleaned the milk machine about a month ago, decided to ignore my carpel tunnel, and away I go, hand milking. I prefer it, but cannot milk them in numbers by hand! I love reading about your goats and your life on the farm. As a city girl, I crave to have a farm, maybe one day I will. I also will say that I LOVE LOVE LOVE the soaps I purchased and the samples you sent along. I am a new goat milk lotion and soap convert! Keep up the great work and the great blogs. I also love looking at the pics of the goats. Way to cute!! I am a city girl conversion myself. My father was in the service, we did not live in one place for long. Most of my adult years were spent living within city limits, though…but my heart from the beginning of my childhood memory was in the country, with animals. Thank you for your positive thoughts. They are appreciated! I hope you continue to meet your dreams as well! I love to hear you talk about your wonderful goats, Mary. You care for them with so much love. Delores, they are very close to my heart. Passionate about animals.